Melt the butter in the tarte tatin tin or an ovenproof frying pan until it begins to foam. Add the sugar, stir into the butter and cook until caramelised and golden. Season the tomatoes with salt and freshly ground black pepper, then add to the tatin pan, cut-side up. Cook them for three minutes, then remove from the heat. Scatter over the thyme and goat's cheese. 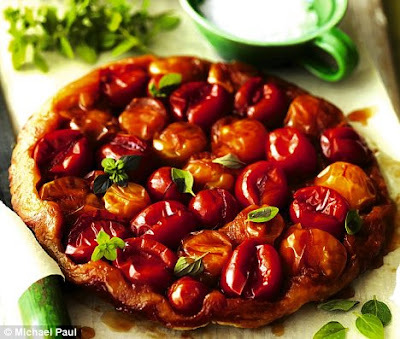 Place the pastry over the tomatoes in the pan, press down gently and tuck the edges around the tomatoes. Brush with the beaten egg and bake in the oven for 25 minutes until golden. Remove from the oven, place a plate on top of the pan, then turn out the tarte by very carefully flipping it over. Cool, then cut into slices and garnish with basil or wild rocket.